The Alabama Domestic Nonprofit Corporation Certificate of Formation is the application that must be filed in order to operate this type of corporation in Alabama. The first step is to make sure that no other entity has the same name as your nonprofit. If so, you must select another. 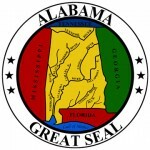 You may find this information through a website service provided by Alabama’s Secretary of State (https://www.alabamainteractive.org/sos/welcome.action). This may take up to fifteen days so make sure to keep an eye our for responses. 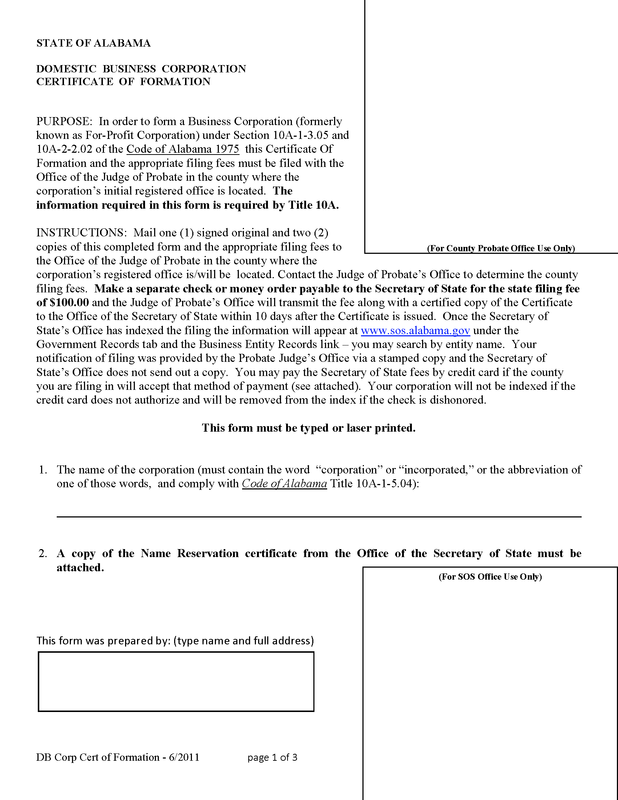 Once you have solidified a name you must print this certificate online then proceed to the application. 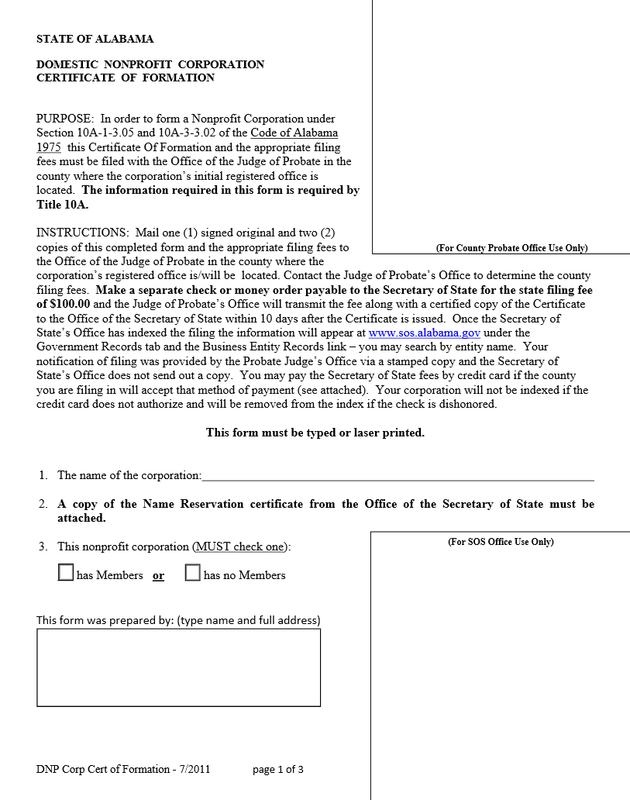 The Alabama Domestic Nonprofit Corporation Certificate of Formation may then be filled out. This must be done by a laser printer on your computer (provided you have the correct software such as Adobe) or by printing it out then typing in the information. This application must be submitted in triplicate (one original and two copies) to your local Judge of Probate’s office with the appropriate filing fee for your county, a 100.00 state processing fee, Name Reservation Certificate, and any supporting documentation you may have. Step 1 - On page one, enter the name of your nonprofit corporation on the first line. Next indicate if the nonprofit does or does not have members by checking the appropriate box in the third item. Finally, locate the box under the words “This form was prepared by” and enter (or type) the preparer’s full name and address. Step 2 - On the second page, fill in the street address of the corporation’s principal office. If the mailing address differs from the street address then enter the principal office mailing address. 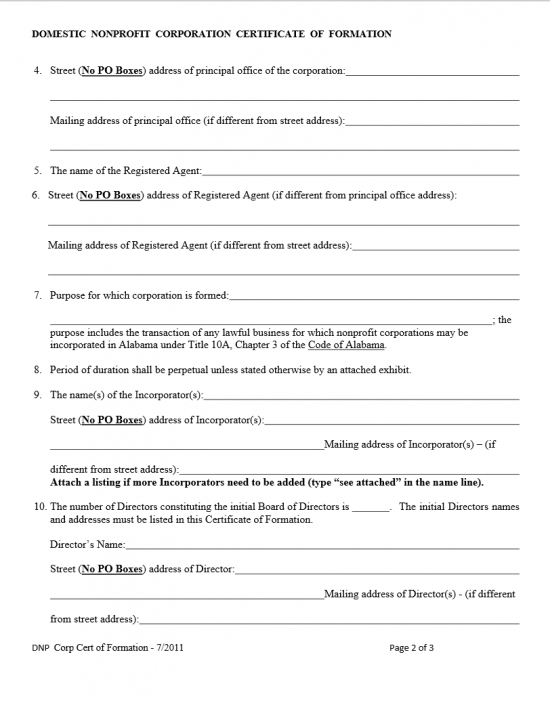 Next you will need to fill in the registered agent’s full name and full address. You will then need to report on the purpose of the business. Be specific and remember this must be compliant with the Alabama State Code Title 10A. If this is done successfully, use the rest of this page to list the full name of each incorporator of this nonprofit along with each one’s street address and (if different) mailing address. 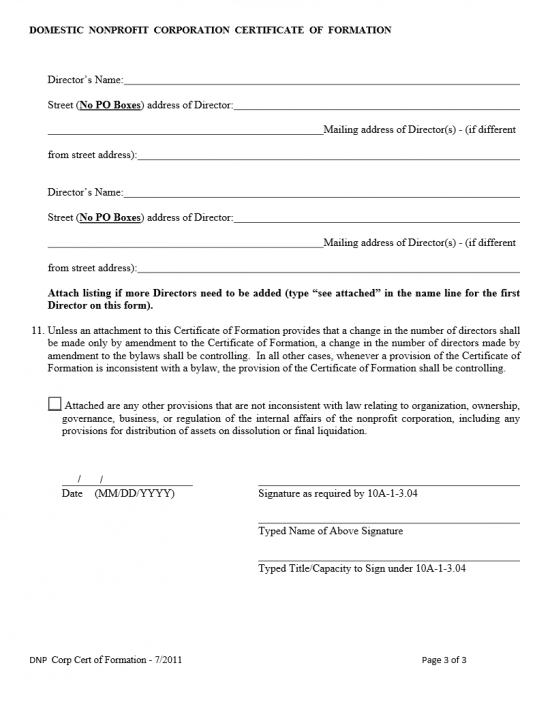 This will be followed defining the number of Directors on the board then listing each one’s full name, street address, and (if different) mailing address. The rest of page two will provide enough room for one Director’s information while the top of page three will give enough room for two more. Keep in mind, each Incorporator and Director must have this information registered here, so if there is not enough room you will need to document the remaining parties then attach it to this application form. 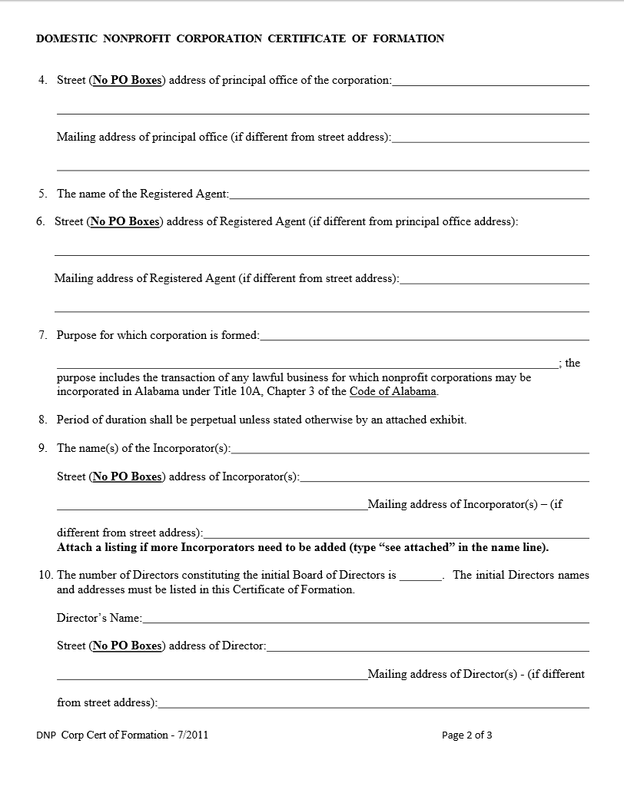 Step 3 - On the third page, below the Director information to be supplied, there will be a box in the eleventh item that should be marked off if additional documents are to be attached. (Remember, you must attach your Certificate for Name Registration at the very least). Finally the Oganizer of this certificate must date and sign his/her name (State Code of Alabama 10A-1-3.04). This signature version must be accompanied by the printed version of his/her name (typed or printed with a laser printer) along with his/her official title. Step 4- Once this form has been completed and the attachments organized, it will be time to take care of the payment. 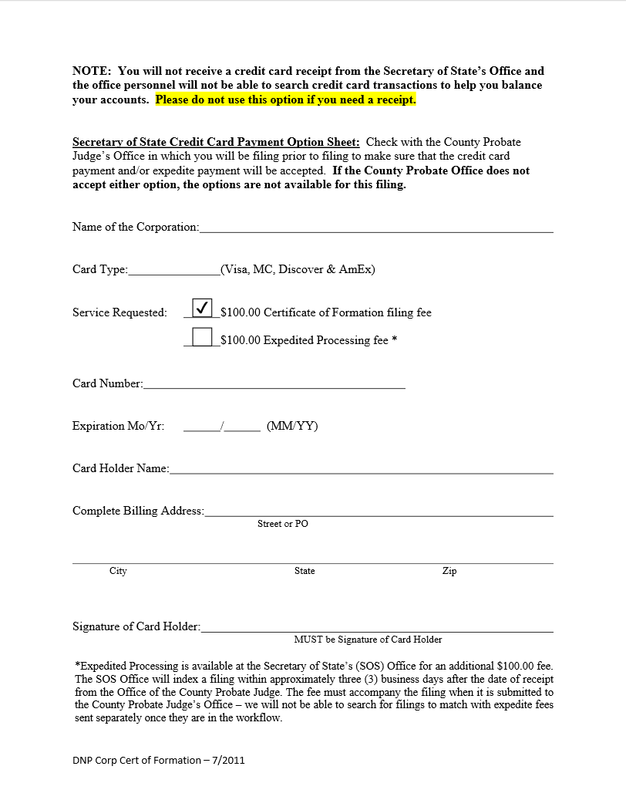 Page four will allow some documentation for credit card payments (should one prefer this over a check or money order). First enter the name of your corporation, then enter the card type. Next you must place a check mark in the box labeled “$100.00 Certificate of Formation filing fee.” There will also be an optional box to check, if you wish to expedite this application for an additional $100.00. Once one or both of these boxes have been checked, enter your card number, expiration date, the cardholder’s name, the billing address associated with the card of payment, and finally the card holder must sign this page. Step 5 - Now that all the information has been supplied and the required attachments prepared, make two copies. You will need to send in two copies and one original to the address indicated by the Judge of Probate where this property is located. Remember, there may be an additional county filing fee. If you are paying the State’s processing fee by check, make the check payable to “Secretary of State.” This will be separate from any payment instructions provided by the Judge of Probate. Note: The fourth page only covers credit card payments for the state processing fee. The county this property is in may have a separate form, allow phone payments, or simply not accept credit cards. You must contact your county’s Office of the Judge Probate for such instructions.